Preference - thanoscardgamess jimdo page! Preference is basically a game for three players and is played in different versions across a wide area of Central Europe and Russia. 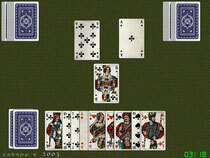 Here you can play the Austrian version which is related to the those played in Croatia, Slovenia and Trieste (in N.Italy) as well as in Russia and Greece (under the name "Prefa").In each hand, one player (the declarer) chooses the trump suit and tries to make six of the ten possible tricks. The other two (the defenders) try to prevent the declarer from winning, but also have an objective to make two tricks each. At the beginning of each hand there is an auction to decide who will be declarer.